Earlier, at the moment when I was elected Prime Minister by both the House of Representatives and the House of Councillors, I was deeply moved, trembling at the thought that Japanese history was in the making. At the same time I felt a great sense of responsibility at the privilege of serving at the forefront in transforming this country into one of popular sovereignty in the true sense of the word. The Democratic Party of Japan (DPJ) will be playing a central role, in a coalition with the Social Democratic Party and People's New Party. The DPJ must work, whatever may stand in the way, to meet the expectations of the Japanese public. This is the strong sense of mission that I now have. The DPJ and its allied parties emerged triumphantly from the major struggle that this election was. Needless to say, however, this victory was not the triumph of the DPJ. It is the result of the public casting votes for the DPJ and its partners with a sense of expectation. History has not yet been made in the true sense. Whether it will be depends on our work from now on. During this election, we often heard all around the country numerous expressions of anger, dissatisfaction and sorrow from the public. How did Japan turn out like this, why did my hometown become like this--these thoughts we must keep firmly in mind. And we must assume the heavy mantle of squarely meeting those concerns. That is to say, the victors in this election were you, the entire Japanese nation, and in order to make this triumph of yours ring true, we will persevere throughout in forging politics for you the people. And in order to do so, we will in turn present to you now politics that sheds its dependence on the bureaucracy, so to speak, and put it into practice. Within various structures, we intend to engage in politics in which politicians shed their dependency on bureaucrats, with politicians maintaining the initiative while still using the brilliant minds of civil servants. Beyond that, it is obvious. It is politicians who connect with your minds, those of the people. In that spirit, we will take to heart the various thoughts among the Japanese people, about changing politics, and why they want us to change politics. I intend to keep these thoughts firmly in mind as we depart, prepared as best possible, on a major voyage. To make this possible, I ask the public not to be content just in having cast their ballots but urge them to voice their views on various matters to the government. I should like you to participate in this administration. I should think it can be said that the degree to which the thoughts of the public can be solidly encapsulated into public policy depends upon the participation we have from the general public. It was in such a context that we wrote up our Manifesto. Whether the issue be "child allowances" or others such as to somehow rectify the pensions system, which is now in tatters, we must first and foremost eliminate waste, amidst concerns over how to pay for them. This has also been the thought behind creating the Government Revitalisation Unit. In addition, I intend to launch a National Policy Unit [Kokka Senryaku-shitsu]. My idea is to meet the expectations of the public by having the Unit outline major roles to be played by the state as well as the guiding principles. I suspect that we will fail at times in a series of trial and error. I should very much like to ask people to be tolerant in this regard. After all, in a sense we are encountering the unknown, that is, taking a plunge into a world in which we have no experience. In order to forge a nation of political leadership, popular sovereignty, and local sovereignty in the truest sense, we will have to conduct various kinds of trial experiments. Therefore, I would be most grateful if the public could patiently foster this new government. These were the thoughts we had when we resolved to form a coalition government. At all events we will introduce a new kind of politics that meets public expectations. That is the sole thought on which we established a coalition government. As we launch this government with everyone savouring that thought, I hope most sincerely for the guidance and support of the public, alongside their patience. QUESTION: What do you see as the most important policy issues for your administration in the near term? Also, with regard to the child allowance that you mentioned just now and the like, the question of fiscal resources is still being pointed out. How will you address this situation? At the same time, there are concerns regarding adverse effects on the economy as a result of cancellations in budget execution. How will you reconcile these two aspects [of budget re-allocation]? Please answer these two questions. PRIME MINISTER YUKIO HATOYAMA: First of all, on the policy issues I attach importance to, these are quite evident. They are those in the Manifesto, which I earlier mentioned briefly. Since this is a coalition government, we will in this government be firmly implementing the contents on which we have reached agreement within the the coalition. As for the DPJ, the party hopes before all else to initiate a child allowance, as well as abolish the provisional tax rates [which raise the petrol and automobile weight taxes]: policies and measures that stimulate people's domestic finances. As you just said, we want to carry out very quickly policies which would make the public feel that their financial condition has improve a little, and that they can place hope in this government. That leads us to the issue of fiscal resources. We will immediately put into operation the Government Revitalisation Unit, which will, in addition to doing other work, thoroughly separate out the various operations conducted by the government. I should like all government ministries and agencies to do their utmost to eliminate governmental waste. I believe we have more or less worked out how to secure the necessary resources; as for the first fiscal year, we are certain that we can secure the necessary amount, which is somewhat over seven trillion yen. I believe we need completely to overhaul the package of economic countermeasures and the supplementary budget [that was being implemented by the previous government]. Therefore, I expect that there will be areas where I will ask for a halt in budget execution. That said, as far as the regions where budget execution is going ahead, we would like this in principle to continue, provided that the budget item in question is deemed to be helping the revitalisation of that region. On the other hand, those budget items which do not meet this requirement, those whose implementation has not begun, will need to be reviewed radically. That is where I stand on this issue. What we would like to say, as I just mentioned, is that we will give careful consideration to such cases where work has already begun and there would be serious consequences should this be halted. At the same time, we will be reviewing those budget items that are wasteful or whose money could be better spent, thereby setting out more effective steps forward. QUESTION: Prime Minister Hatoyama, you reiterated your strong determination to make politics that sheds its dependence on the bureaucracy a reality. Strong resistance to this is to be expected among bureaucrats. Please explain in concrete terms how you intend to bring about politics that sheds its dependence on the bureaucracy, including the positioning of the National Policy Unit [Kokka Senryaku-kyoku]. 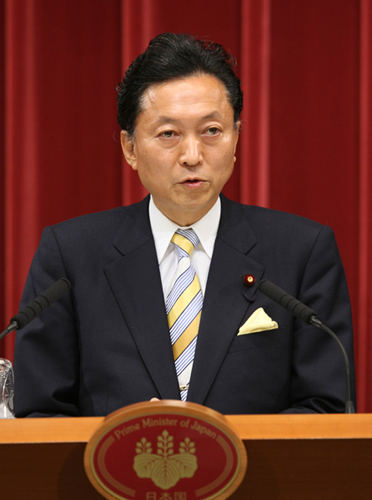 PRIME MINISTER YUKIO HATOYAMA: First of all, we intend to have decisions on policy made in the various government ministries by Minister, State Secretary and Parliamentary Vice Minister, i.e. the incumbents of the so-called "three politically-appointed top posts". It goes without saying that we do not have any reason to reprimand excellent bureaucrats who work hard for the Japanese people. However, to deal with [government activity which does not quite benefit the people], we will be creating a system in which essentially politicians play the main role in the decision-taking concerning the operations of government ministries. As I believe I've mentioned, we will set up Cabinet committees [on each important policy matter]. Particularly in the case of projects that fall within the remit of several government ministries, we will have these committees do most of the decision-taking, with the [full] Cabinet meeting to take the final decisions on these matters. As we have abolished [permanent] vice ministers' meeting [which used to be held the day before each Cabinet meeting], I do not foresee this process being distorted due to resistance from bureaucrats. Obviously, leadership will be assumed by politicians at the National Policy Unit [Kokka Senryaku-kyoku] and Government Revitalisation Unit. In particular, the National Policy Unit [Kokka Senryaku-shitsu] will debate in particular the overall framework of the budget, and I have entrusted Minister [Naoto] Kan with those duties. Let me state here my great expectations on Minister Kan's tremendously capable leadership. Likewise, I hope Minister [Yoshito] Sengoku will fully exert his leadership at the Government Revitalisation Unit, with those at the level of State Secretaries at various ministries also assuming suitable roles within the Unit. I hope those concerned shall exert political leadership to ensure that wasteful projects are thoroughly eliminated, starting with work in order thoroughly to separate out the various operations conducted by the government. I intend to carry out politics that sheds its dependence on bureaucrats by making full use of this range of approaches. QUESTION: Prime Minister Hatoyama, with regard to [the fiscal resources required] next year [to implement] the Manifesto, you stated that you have more or less worked out how to secure the necessary 7.1 trillion yen (sic). But, presumably the formulation of the budget for next fiscal year will be a pressing issue. My first question is, will you be reviewing the budget "ceiling" from a zero-based budgeting approach? Also, will you formulate this budget by the end of the calendar year? And would you aim to enact the budget by the end of the present fiscal year [March 2010]? What are your current ideas concerning the schedule of such matters? PRIME MINISTER YUKIO HATOYAMA: My fundamental stance is to have discussions conducted urgently and in depth with the Finance Minister as well as Minister Kan of the National Policy Unit [Kokka Senryaku-shitsu] playing the central roles. What I would venture to say is that the methodology employed thus far will be reconsidered from a zero-based budgeting approach. I intend to have the "ceiling" method fundamentally rethought. Although we are starting somewhat late, my intended schedule at this point to is to formulate the budget [for fiscal 2010] by the end of this calendar year. QUESTION: You will be visiting the United States for the United Nations General Assembly, and I presume you will also take part in a Japan-US summit meeting. In concrete terms, what sort of policies will you be pursuing in order to deepen Japan-US relations? The coalition agreement states that it is now a turning point so far as the revision of the Status of Forces Agreement is concerned. I would like to know in concrete terms whether or not you plan to put this matter on the table [at the forthcoming summit meeting with the US]. PRIME MINISTER YUKIO HATOYAMA: While I am still hopeful that a date and time for a Japan-US summit meeting [next week] will be set, we are not yet in a situation to know what that date and time would be. Speaking to you on a hypothetical basis then, I would say that the first step that needs to be taken is to build a relationship of trust with President Obama. In that sense I would suggest that the most important thing in this [meeting with the President Obama during my] visit [next week] to the US is enhancing that sense of trust through a frank mutual exchange of views. As for issues such as what is known as the Status of Forces Agreement, I am currently of the opinion that, obviously, our fundamental stance will not change. It is also true that the coalition agreement states that we will make efforts towards a revision of this Agreement. Nevertheless, the main thrust of this [summit] meeting will be to foster a relationship of trust. I believe it important to spend a certain amount of time on a comprehensive review of the range of issues in the Japan-US relationship, including that of security-related issues. And it would be important to advance discussions during the time that we set aside. I should like you to understand that we consider the creation of a relationship of trust to be the key [at next week's summit meeting]. At the risk of repeating myself here, in order to do that, I believe that we need to create a rapport which enables us to speak to each other without reservation. Japan has until now has tended to be somewhat passive within the Japan-US relationship. I should like to foster a relationship in which Japan plays a proactive role and can discuss its views frankly with the US. I will work to achieve a conclusion [on the matters you raised] within such a relationship. QUESTION: I would like to ask about the government's stance on the abduction issue. There are two ministers in your Cabinet, Minister Kan and Minister [Keiko] Chiba, who signed a petition for the release of former death row inmate Shin Kwang-soo, a criminal responsible for the abduction of Megumi Yokota by North Korea. It seems to me that there is a risk of sending the wrong message to the North Koreans as we are about to press them for the resolution of the abduction issue. What are your thoughts on that? In addition, do you intend to ask these two ministers to express remorse or apology to the families of the abduction victims? PRIME MINISTER YUKIO HATOYAMA: I believe that the events of the past you cite are true. However, what is of paramount importance in dealing with North Korea is that we move forward pragmatically in seeking to resolve the abduction issue. For that reason, as well as others, in my Cabinet I have appointed Hiroshi Nakai, Minister of State and National Public Safety Chairman to be the Minister in charge of the abduction issue as well. I place great value on the fact that he has been extremely assertive in taking action on the abduction issue thus far and I myself intend to spare no effort so that we see good progress on the abduction issue. I have no intention at present to question the two ministers regarding matters of the past. QUESTION: I have two questions, one being a point of confirmation related to the formulation of the budget as mentioned earlier, and the other a question with regard to the new Cabinet. Insofar as the formulation of the budget will be an urgent issue in the near future, will the command centre for its formulation be the National Policy Unit [Kokka Senryaku-kyoku], or will the Ministry of Finance assume that role? My second question is, when you were Secretary-General of the DPJ, you said with regard to the Nishimatsu Construction Co. illegal donations incident that the investigation was "politically- motivated". Now, having assumed governmental power, do you still maintain that position? And, if you maintain this view on the investigation, did you take any particular points into account when selecting your Justice Minister? PRIME MINISTER YUKIO HATOYAMA: First, on formulation of the budget, I will have the National Policy Unit [Kokka Senryaku-shitsu] discuss the fundamental structure of the budget. That is to say I will have the National Policy Unit [Kokka Senryaku-shitsu] design the framework, as opposed to drafting the details. It was with that in mind that I created the National Policy Unit [Kokka Senryaku-shitsu]. Fleshing out the specific details from a well-designed framework is a role that will be centred on the Finance Minister and the Ministry of Finance. As both will be involved in how much waste can be eliminated, together with the Government Revitalisation Unit, the three should advance their discussions cohesively and divide their respective roles as appropriate. Next, I did indeed once use the words "politically-motivated investigation" with regard to the Nishimatsu incident, but I did not use them twice. That is to say that I have been refraining from using them again, regretting having used those words on one occasion. I hope you understand that that is my position. QUESTION: With regard to the East Asian community that you advocate, when and in what form do you intend to make it more widely known to the international community during the upcoming diplomatic calendar? In addition, your views on a common Asian currency for this community seem to be interpreted in the United States as an intention to move away from the US or away from the US dollar. How would you respond to such concerns? PRIME MINISTER YUKIO HATOYAMA: As you know, the spirit of fraternity in one sense serves as a starting line. In the case of the EU this has extended as far as a common currency, the euro. I feel that to envisage a regional community in Asia, particularly in East Asia in the medium to long term is the correct path to take, even though in a sense there are major differences in our countries' systems. This idea certainly is not intended to exclude the US dollar or the United States. Quite the contrary, as a step beyond this initiative I believe we should envisage an Asia-Pacific community, and I do not think that this could readily be achieved without the United States. I should like to elaborate on this vision as early as possible, and leaving aside the degree of detail that can be discussed, I am planning to speak about this idea in some form or another in my forthcoming address at the United Nations. So I am thinking about raising the idea in a preliminary manner, but I haven't thought this through yet. QUESTION: I would like to ask you about the issue of political donations you received from individuals. You have consistently maintained that you have sufficiently fulfilled your responsibility to explain this issue of donations from individuals. However, it is I think inevitable that you will be subjected to very pointed questions from the opposition parties in the extraordinary session of the Diet and elsewhere. What do you have to say on the effect that this issue will have on your handling of the government, and on whether you intend to offer any further explanation in the future? PRIME MINISTER YUKIO HATOYAMA: I have apologised to the Japanese people for the extensive consternation I have cause because of this matter, and have made my best efforts to rectify and remedy [the report on receipts and disbursements of political funds]. I accept that indeed I have struggled to gain the understanding of the public on this matter. Thus I should like to make further efforts to explain it more fully. I intend make efforts to convey my thoughts to the Japanese people as honestly and accurately as possible, taking into account developments surrounding the matter, so that they will be able to improve their understanding of it.